This is the Saga of the Historical 1871 Nevada State Prison Break. After a murderous shootout at the prison on the outskirts of Carson City, six of the twenty-nine escapees, carrying two Henry Rifles, fled south. The gang, led by Charles Jones, sought to reach the Sierra Nevada to reach safety on the western side. After killing a mail rider near Sweetwater, Nevada, they traveled on into California’s Eastern Sierra Nevada where their atrocities continued. Hearing of their deeds, a posse from Benton Hot Springs followed the six desperados to beautiful Monte Diablo Lake above Long Valley and spotted them late in day on September 22. They decided to wait until morning to round up the convicts. Local cowman Alney McGee put up the lawmen for the night. The next morning a deadly gun battle took place and the posse was routed. 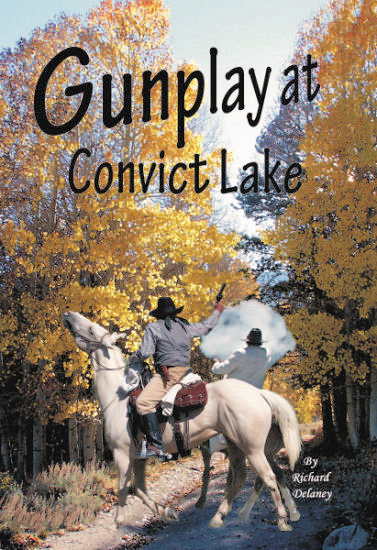 Not long after the shoot out, local Mono and Inyo County residents renamed the site where Robert Morrison and Mono Jim Were Killed - Convict Lake. Please read the first couple of chapters. Hopefully it will entice you to buy the book!